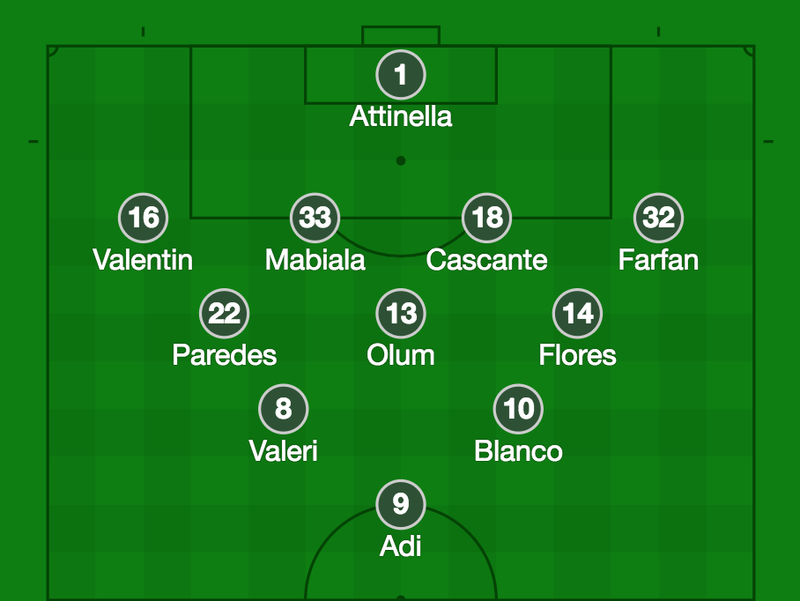 This is how Portland lined up for Saturday's 0-0 tie with Sporting KC. There has been rotation at nearly every position this season for Portland, but Valeri and Blanco have been mainstays behind the striker in the 4-3-2-1 formation. One thing Gio Savarese is especially known for as a manager is his willingness to be tactically flexible. He has used a number of different formations throughout his coaching career and often tinkers with his player’s spacing throughout matches (like good coaches often do). When the Timbers began this season on a five match winless streak, it became evident that changes needed to be made. Fortunately for Portland fans, Gio stepped up to the plate and shifted to the Christmas Tree formation - a 4-3-2-1. Whether you like it because of its cool name and infrequent use in modern soccer, or hate it because it has a stupid name and you believe it is largely outdated in the modern game, Savarese has managed to get some positive results out of it in Portland. The Timbers have now gone eight straight games unbeaten in Major League Soccer and nine in all competitions. The Timbers play a traditional back four with three defensive minded midfielders sitting in front of them. When back in defense, this almost makes a compact “block of seven” that opposing teams have trouble breaking down. The back four is relatively reserved in the attack. The only player that has a more consistent role getting forward is right back Alvas Powell, who likes to get high and outside on the right wing to provide width and occasional service into the box for the striker. The three midfielders in front of them (usually a combination of Diego Chara, Cristhian Paredes, Andy Polo, and Andres Flores) act as a defensive pivot between defense and attack. These players like to aggressively win the ball back in midfield and play it quickly forward. This defensive unit is exactly what allows Valeri and Blanco, the “2” in the 4-3-2-1, to perform at such a high level. With the defensive cover they receive, the two Argentinian midfielders are given freedom to put in less defensive work and focus more on promoting attack. Valeri has always been a central attacking player with freedom to roam. This formation shift, however, has licensed Blanco to start centrally as well, allowing his technical skill set to be more effective. To best utilize this skill, Portland plays a more direct passing style through center of the field. We can see this reflected in the numbers and in the game film. The Timbers are third in Major League Soccer in average vertical distance passing, with an average of 4.82 yards per pass. The only two teams above them are the high-energy Red Bulls and the revitalized pressing Revolution. Here is an example of the Timbers playing that direct style through their playmakers. With this style, Portland are also extremely deadly on the counter. Because Valeri and Blanco have the freedom to sit behind a single high striker, they can get out quickly and break in transition. Their combined technical ability allows them to make quick, precise moves up the field, either dribbling through defenders of passing through them. As mentioned in the opening paragraph, other teams have talented attacking duos. However, no team in Major League Soccer utilizes their star attackers in such a unique way. When you game plan for the Timbers, you can’t just set up to stop one creative and relatively central attacker - you have to set up to stop two. For opposing teams, this has been nearly impossible to do and the numbers prove it. Because I’m fully committed to the Christmas tree illustration, pretend that the numbers we are about to rip into are like presents under the shimmering tree that our “Fun Uncle Gio” went out to get for us. With that explanation out of the way, now we can really get into these presents, uh, I mean stats. Valeri and Blanco both sit relatively high up the league’s leaderboards in terms of expected goals plus expected assists. Diego Valeri (7.3) and Sebastian Blanco (5.4) are one of only six attacking midfield duos in MLS to have over 5.0 xG+xA each. They are the only duo out of that bunch to both consistently play centrally instead of out wide. In addition to xG+xA, both Valeri and Blanco are in the league’s top 25 in terms of key passes (passes that lead directly to a shot) with 28 and 25 respectively. The Timbers are one of only three teams - Sporting Kansas City and San Jose are the others - to have multiple players in the top 20 in key passes. Speaking of passing, Valeri (257 passes) and Blanco (259 passes) are both inside Major League Soccer’s top 20 in terms of passes in the final third. Portland is the only team in MLS to have two central attacking midfielders inside that top 20. For a team with only 45.7% possession (10th in the West), the high usage that these two playmakers get in key attacking areas is well-illustrated here. Their combined goal plus assist tally of 16 is barely less than the rest of their entire team combined (18 G+A). Both players sit at the top of their team’s goal tally: Valeri has six and Blanco has five. Both are in the top 25 in terms of goals minus expected goals, meaning they convert chances at an especially high rate. Alone, either Valeri or Blanco would be good for Portland. Together in the Christmas tree, they combine to make one of the highest-producing, most intriguing attacking pairings in all Major League Soccer. The numbers only help to prove it.